The global market research report on “Skin Rejuvenation Market: Global Industry Analysis (2012-2016) and Forecast (2017-2022)” covers several trends, opportunities, drivers, challenges etc., by covering several market segments. The report covers a global perspective analyzing the most important regions of North America, Europe, Latin America, Asia Pacific excluding Japan (MEA), Japan and Middle East and Africa (MEA). This provides a global view covering all the key areas thus delivering a holistic angle of the market. This can enable the reader to list out regions with optimum potential in order to slate investment decisions and expansion strategies. The research study eliminates all the biasness giving a more realistic shape to the market numbers. The data mining done to get a clear understanding of the market involves all sorts of number crunching thereby chalking out a detailed statistical market report. The global skin rejuvenation market research report covers all market angles by including a weighted market segmentation. Human skin undergoes numerous changes due to aging. Few of the mare dry skin, skin thinning, wrinkles, sacking and loss in elasticity, subcutaneous fat tissue loss, decrease in production of sebum, actinic keratosis, teleangiectasias and pigmentation disorders. Skin rejuvenation is a cosmetic medication that includes series of cosmetic medications that aim at enhancing the skin features by reversing ageing signs. This process ensures reduces wrinkles, lines, sagging skin areas and loose skin areas thus giving a younger skin appearance. This is done with the assistance of selected medical and surgical procedures. There are several methods involved in skin rejuvenation, such as, microdermabrasion, chemical peels, dermabrasio, IPL photo rejuvenation, ablative lasers and Er: YAG, fractional resurfacing, non-ablative lasers, radiofrequency, LED devices etc. Persistence Market Research has thoroughly analyzed the global market for skin rejuvenation. In its recent publication on global skin rejuvenation market, numerous market facts and their impact have been understood. This analysis is done across key regions in the globe to get a real picture of the global market. Various growth fuelling factors like drivers, macroeconomic aspects, trends, developments, product innovations and restraints have been thoroughly examined and included in this research study. The qualitative analysis present in this report offers a supporting arm to the reader by providing critical value addition by delivering forecast projections for each segment and sub segment for a period of five years, from 2017 to 2022. According to Persistence Market Research, the global market for skin rejuvenation witnessed steady growth since 2012. This analytical research report says that the trend is expected to grow in the coming years and the global skin rejuvenation market is projected to grow at a high CAGR to reach a market valuation of around US$ 2.2 Bn by the end of the forecasted year. According to this research report, the North America region is expected to be a highly lucrative region for the growth of the skin rejuvenation market. This region reflects high market attractiveness, and is the largest regional market for skin rejuvenation. It has been leading the market since past years and this is most likely to continue over the forecast period. 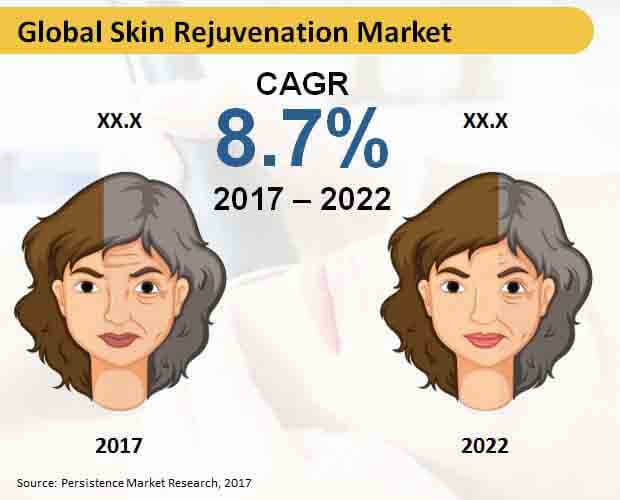 The global skin rejuvenation market in North America is expected to witness the highest growth to register a healthy CAGR of a bit under 9.5% throughout the period of forecast. Following North America, Asia Pacific excluding Japan region shows high potential in the coming years, with a robust growth rate during the forecast period. IPL devices segment by product type is expected to be lead the global skin rejuvenation market by product. This segment is likely to be the largest segment owing to increased adoption for IPL devices for the purpose of skin rejuvenation across the globe, especially in North America. This segment is estimated to reach a market valuation of more than US$ 690 Mn by 2022 end, growing at a stellar rate throughout the period of forecast. Also, this segment is expected to gain the highest BPS by the end of the forecasted year. Laser based devices segment by product type also shows higher potential in the coming years. This segment is anticipated to reflect a 1.5x increase in market value by 2022 end, securing its second position with respect to market value as well as growth. This segment is projected to grow at a healthy rate to register a 9.7% CAGR during the forecast period. Various aesthetic device manufacturers are focusing on the laser technology owing to numerous benefits it offers. Moreover, this technology used in skin rejuvenation has witness increased adoption in the recent years. The analytical research report on global skin rejuvenation market covers a separate section on competitive assessment that analysis various key players involved in skin rejuvenation. The players include manufacturers of devices for medical aesthetics such as Alma Lasers, Ltd., Fotona d.d., Sciton, Inc., EL.En. S.p.A., Lynton Lasers Ltd., Solta Medical Inc., Lumenis Ltd., Cynosure, Inc., Strata Skin Sciences, Inc., Syneron Medical Ltd., Lutronic Corporation and Cutera Inc.